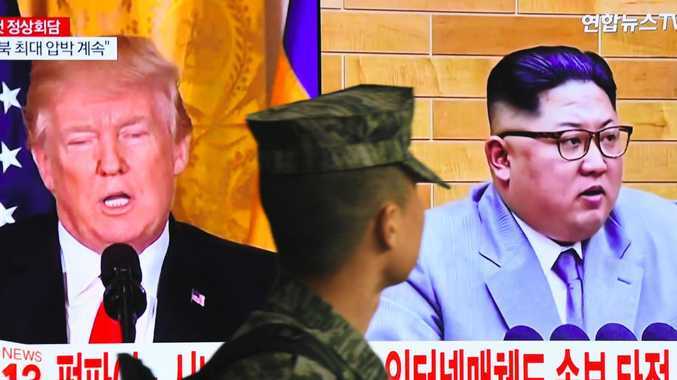 A South Korean soldier walks past a television screen showing pictures of US President Donald Trump (L) and North Korean leader Kim Jong-un ahead of their historic summit. KIM Jong-un described his first talk in Vietnam with Donald Trump as "interesting dialogue" while the US President teased reporters that the chat had been mind-blowing. "Boy, if you could have heard that dialogue, what you would pay for that dialogue?" said Mr Trump, after appearing to joke with the North Korean leader as he sat down for dinner. "It was good." The President said the pair had a "great relationship" and predicted their summit in Hanoi could be "even greater" than their historic meeting last year. The two leaders smiled and shook hands for the cameras in front of a dozen US and North Korean flags, before meeting at the Sofitel Metropole Hotel in the Vietnamese capital. They were joined by a small entourage for a dinner of shrimp cocktail, grilled sirloin with pear kimchi and chocolate lava cake, washed down with a punch made from dried persimmon, an Asian fruit. But only one US reporter was allowed to attend the dinner after journalists were criticised for shouting questions earlier in the day, infuriating news outlets eager to learn what was discussed. The White House Correspondents' Association said it "strenuously objected" to the "capricious decision", and warned the President "should not telegraph weakness by retreating behind arbitrary last-minute restrictions." North Korean reporters were permitted to attend the dinner. The White House had attempted to bar all US reporters, but relented after photographers said they would not cover the event if reporters were not allowed in. Mr Trump then returned to his hotel to prepare for the leaders' official and more substantial meeting on Thursday, saying it would be "busy". But he stayed up late watching Michael Cohen testifying to Congress in Washington, retweeting his own accusation that his former lawyer was a liar. Senator Lindsey Graham told CNN Mr Trump was upset there were "duelling shows" - his North Korea summit and Cohen's testimony. In brief remarks before the dinner, Mr Trump told reporters he was "satisfied" with North Korea's path towards denuclearisation. "We made a lot of progress," the President said of their first summit in Singapore. "I think the biggest progress was our relationship, is really a good one. "It is an honour to be with Chairman Kim. It's an honour to be together in a country, Vietnam, where they have rolled out the red carpet and they are very honoured to have us. "It's great to be with you. We had a very good first summit … Some people would like it to go quicker, but I'm satisfied. You're satisfied. 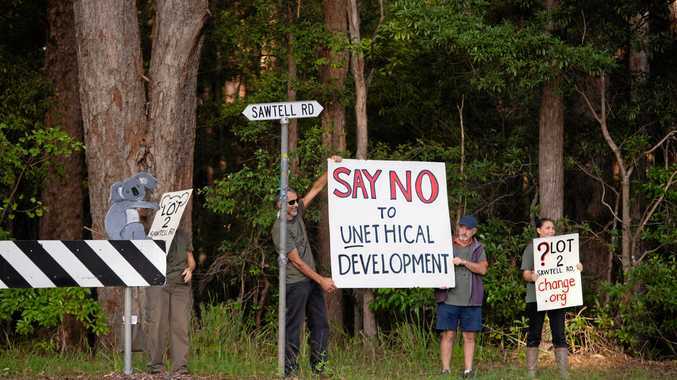 We want to be happy with what we're doing." He said his counterpart was a "great leader" and "will have a tremendous future for your country." Kim smiled as Mr Trump shook and grasped his hand while they were photographed by media from around the world. The North Korean leader said "a lot of obstacles" had to be overcome for the summit to occur but he was "confident there will be a good result". The past few months had seen a lot of patience and effort, he said. The pair took turns praising each other, with Kim saying Mr Trump meeting him was a "courageous decision". 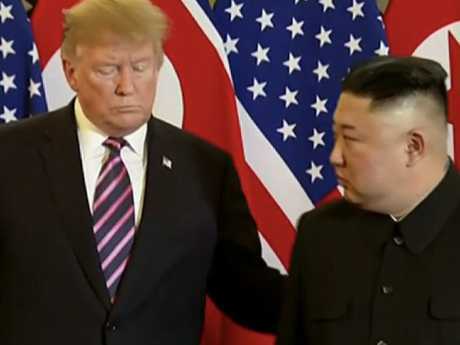 "I am certain that a great outcome will be achieved this time that will be welcomed by all people," Kim told Mr Trump. "I will do my best to make that happen." He said the "outside world" had "misunderstood" the US-North Korean relationship in the period after the Singapore summit. In Singapore, Kim signed a loose promise to work "towards the denuclearisation of the Korean peninsula", but the two sides have since disagreed over what that actually meant. "We came all the way to Hanoi to meet again," Kim said. Apparently referring to the past eight months and the disagreements, he added: "When I think about, it was a period where we needed more thought, effort and patience than at any time." The two leaders had previously exchanged insults, with Mr Trump called Kim "little rocket man" and promising "fire and fury" if the North Korean leader did not half his nuclear program. Donald Trump meeting Kim Jong-un in Hanoi. The leaders then headed into the dinner, Mr Trump accompanied by secretary of state Mike Pompeo and his acting chief of staff Mick Mulvaney, while Kim has the vice chairman of the Worker's Party of Korea Kim Yong Chol and the minister of foreign affairs Ri Yong Ho with him. During the meal, the President praised a photographer for his pictures, before joking that the "media make us look very good! ", according to media present. As the two parties sat down to eat, crammed around a relatively small table, Mr Trump said "our relationship is a very special relationship", with Kim later adding he and the President "shared a lot of interesting stories". Mr Trump thinks he can convince Kim his country could thrive economically if he abandons his quest to become a nuclear power. "We'll see what happens, but he wants to do something great," the President said before the meeting, adding that Kim could use Vietnam - their host for their second summit - as a model for economic revival. "If you look at what you've done in a short time, he can do it in a very, very rapid time - make North Korea into a great economic power." There is speculation in Hanoi Kim expects to return home with economic rewards, including partial sanctions relief. But there's growing worry among analysts that Mr Trump, who will be desperate for an agreement, will give Kim too much and get too little in return - a peace declaration for the Korean War that the North could use to eventually push for the reduction of US troops in South Korea or sanctions relief that could allow Pyongyang to restart economic projects with the South. Asked if this summit would yield a political declaration to end the Korean War, Mr Trump told reporters: "We'll see." Critics of Mr Trump insist he must obtain real commitments from North Korea over abandoning its nuclear weapons before giving away important negotiating leverage too soon. The high-stakes meeting picks up where the Singapore summit last June left off, with the US likely to seek reassurances from North Korea that it is committed to denuclearisation. There have already been reports that Kim is the one pulling the strings and dictating everything from where the summit was held and where the US media centre could be. 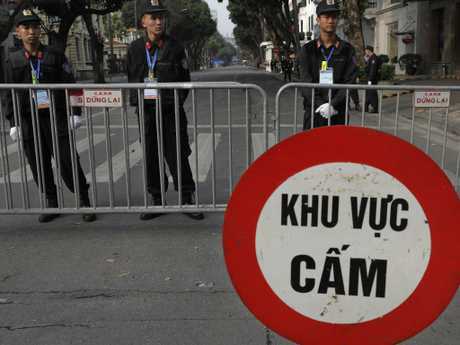 CNN reported the US wanted the summit to be held in Da Nang, which already had secret service clearance for APEC. But the young dictator insisted it be held in the country's capital of Hanoi. He also insisted on taking an arduous 3200-kilometre train journey from Pyongyang to Vietnam - a trip that lasted two and a half days. Flying would have been much faster and would have caused far less disruption to Vietnam's roads and rails. It was also reported that a North Korean official was demanding Vietnamese security and staff tell journalists in the lobby not to photograph Kim or the scene around him. Earlier on Wednesday, Mr Trump arrived at Vietnam's Presidential Palace to meet with the country's top officials. He met with Vietnamese President Nguyen Phu Trong for a photo op and a meeting, where he praised the "thriving" country and the ties between the two countries. He also described Vietnam as a "good example of what could happen" if North Korea was to denuclearise. Mr Trump later joined Prime Minister Nguyen Xuan Phuc, and the pair walked past a line of young children waving US and Vietnamese flags. At one point, Mr Trump stopped and smiled at the children, before waving the flags at the camera. Sitting down for bilateral talks, the two leaders congratulated each other's economic performance. Mr Trump credited Vietnam's "tremendous progress" under Mr Nguyen, since he last visited the country in 2017. He also praised its military equipment.